In the last five years alone, Kaká, Robinho, Pato, as well as numerous costly exports such as Jô, Anderson, Diego and Lucas, have all come out of Brazil. This season there is another bumper crop of young, talented players all of whom could be making a name with one of the big European clubs before too long. So, if you are eager to find out who the next big thing fromBrazil could be, then look no further. Naturally, there’s a lot to choose from and I couldn’t include them all. I’ve not mentioned the likes of Vasco’s Coutinho and Grêmio’s Douglas Costa who have yet to play a first-team game. I’ve also omitted São Paulo’s Hernanes and Alex Silva and Fluminense’s Thiago Neves and Thiago Silva who have been discussed in great detail on this blog and on numerous other sites. The list is not definitive and it contains just a few players that have stood out for me. So, I’m going to start with a footballer I’ve really enjoyed watching this season: Vitória’s Marquinhos. The Série A new boys appear to have unearthed a real gem in this attacking midfielder. Marquinhos is amongst the most gifted footballers in the country. If he had been playing for a club with a bigger profile, you would have heard of him long ago. His classy touch is complimented by a good work rate and he’s prepared to dig in and help out the defence. And if you like cool, just look at the nonchalant way he celebrates his goals. But if any European club is interested in Marquinhos, they’ll need to act fast. The Brazilian football management group, Traffic, have apparently already tabled a bid of around US$4 million for Marquinhos and teammate, Willians. Traffic provided Palmeiras with the cash to buy Henrique from Coritiba earlier this year. Traffic also made most of the profit when the centreback was sold to Barcelona less than six months later. If Vitória have any sense, they’ll hang on to Marquinhos and Willians until a team from Europe comes in for them. 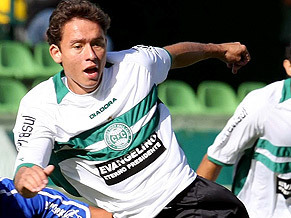 At Coritiba, is the much sought after Keirrison. The forward scored 12 in his club’s successful promotion drive last year. And after missing a couple of months through injury this season, the 19 year-old has already put away 10 goals in the top flight. Kerrison was subject to a bid by Traffic and Palmeiras earlier this year. But Coritiba wisely held on to the forward fully aware that he’s the type of player that can make all the difference. Now, Olympiakos and PSV are sniffing round Keirrison and may offer something in the region of 9 million euros. Also see Is Keirrison worth all the hype? Diogo’s 18 goals were instrumental in helping Portuguesa escape from Série B in 2007. At just 21, the forward still has a lot to learn but his ability has already got him noticed and the forward has already been linked with a number of European giants. His pace, speed of thought and finishing are what makes him an excellent prospect. Santos have struggled throughout the season. But forward Maikon Leite has looked the business. Leite was an unknown just a couple of months ago before Santos plucked him from obscurity at Santo André. The 20-year-old is pacey and can certainly dribble. And, in just a handful of games for the Vila Belmiro outfit, Leite has already proved he can find the back of the net at this level. Guilherme is considered to be Cruzeiro’s best youth product in years (though maybe Kerlon would disagree). This is the forward’s second season in Série A and this year he is amongst the league’s leading scorers with 10 to his name. Guilherme has a deft touch and is not afraid to use both feet when it comes to shooting. The youngster’s ability to find space by losing his markers is exceptional. League leaders Grêmio have Maylson and Rafael Carioca in their ranks but I’ve gone for Anderson Pico. The 19-year-old can use both feet but has been playing on the left for Grêmio in this campaign. As well as tricky wing play, Pico can drift into midfield. Because of his powerful shot, Pico has been touted as the next Roberto Carlos (but so many other players have too!). As I said earlier, this is not a definitive list. So, if you’ve got any of your own suggestions, feel free to add them in the comments. But please restrict your ideas to footballers actually playing in the Brasileiro and not teenage sensations who have never played for the first team. Entry filed under: Brazil: the talent factory, Brazilian football, Keirrison. Tags: Anderson Pico, Brazil new talent, Brazilian new talent, Cruzeiro, Diogo Portuguesa, Douglas Costa, Guilherme Cruzeiro, Hernanes, Kaká, Keirrison, Maicon Leite, Marcos Antônio da Silva Gonçalves, Marquinhos, Marquinhos and Cruzeiro, Marquinhos Vitória, Thiago Neves. The tragedy is that half these players will pack off to Eastern Europe before their twentieth birthday, or end up rotting in the reserves for Udinese; already, Barca are being linked with Gremio’s Douglas for $20,000,000 on one blog…it is such a pity that the South American teams can’t hold onto these wonderkids until they are at least in their early twenties, as we might then see so many more achieving their potential. All of them are attacking players. How about defensive players? talented defender? Defence is always the main problem for Brazil team. Breno is already quite famous ofcourse, but I don’t know how good the others are or their specific qualities, I added them because of their stats, transfers and comments I’ve found on the net. Maybe someone else can give more info. Douglas is the main reason Twente qualified for the Champions League totally outplaying Huntelaar in the playoffs. He is a giant (1.92m) of a man and undisputed in the centre of Twente’s defense. Expect a big transfer next year. I don’t think defense is(or has been) the main problem for Brazil, to name a few (Juan, Lucio, Luisao, Alex, Pepe, Bordon, Aldair, Ricardo Gomes, Edinho), Besides the fact that Brazilians can defend they often can actually play, thanks to their technical skills. A comination of technique, strength and agility is almost a given for Brazilian defenders. Just add speed, intelligence and attitude and voila: worldclass. looks like you know your stuff about Brazilian defenders ! some of the names you mentioned were even new to me! haha actually, i doubt anyone in Brazil has heard of Douglas (ex Joinville if anyone is interested). as far as i’m aware, there hasn’t been that many Brazilians heading to Holland recently – do you have any explanation for this? In general top Brazilian talent is way too expensive. If a player is already at toplevel(selecao/olympic team/Gremio/Palmeiras etc.) he has no business in Holland. So Dutch teams have to find some hidden young gems. the year’ in Holland and then went to Inter. A fantastic signing. But there are a couple of very talented Brazilians here nowadays. Most of them are between 18 en 25. Brazilians in the Dutch league: Bahia, goalkeeper Darley en Manteiga(Feyenoord), Leonardo(Ajax), Ari (AZ), goalkeeper Luciano da Silva (Groningen), Pedro Beda and Paulo Henrique (Heerenveen), Everton (Heracles), goalkeeper Cassio Ramos and Jonathan Reis (PSV), Douglas (FC Twente), Claudemir (Vitesse) and Veloso (Willem II). Douglas and the Heerenveen-duo(in selecao sub 20) are probably the most talented of the bunch. So, it is not the case that Brazilians don’t go to Holland, but they are just not very well known (yet). Dutch teams don’t get crap though, the players are all at least decent. Holland has acquired a good reputation when it comes to developing Brazilian players. Especially Ronaldo & Romario and lately Gomes, Maxwell, Alex and Afonso Alves became outstanding players here. I think the Dutch league is almost an ideal stepping stone for bigger leagues but Holland’s downside for Brazilians is the weather. Hahaha…Romario was always cold. Going to Portugal is the smart choice I think for Brazilians. Easier to adapt to Europe. Latest rumor I’ve heard about a Brazilian coming to Holland is Leo from Gremio to PSV. Don’t think that’s gonna happen. Interesting. Jonathas de Jesus has already got quite a Dutch “history”. He was topscorer of an international youth tournament in The Hague in 2006 and 2007. And at the end of 2007 he had a trial with Ajax (scored in a trial match) but didn’t get a contract. But AZ certainly could use a good striker. He has to compete with Ari da Silva(Bra) and Graziano Pelle(Ita) then. Brazil is often seen as a goldmine for the non-top teams; players are cheaper and better.Today I read an article about coaches from a Dutch professional team who are going to scout (in the winter)in Brazil to find players at an especially for them arranged tournament. One catch: only players with double passports are allowed. Most of the times it it the combination Italian/Brazilian. Non EU-players have to get a minimum-salary that is very steep. Por eso. I can’t wait to see Marquinhos and Willians playing for Verdão this year. If they can get Keirrison too, they’ll be a force to reckon with during Brasileirão 2009. I know it’s a long shot, but maybe Luxemburgo will get his first Libertadores. Can’t wait for the 2009 season in Brazil to begin. Excellent blog by the way Jon. I’ll be following along frequently now that I’ve discovered it. Have you considered that maybe some of us live in Brazil? Surely there are a lot of talented players from all over the world, including Europe and Brazil. Since this is a blog about Brazilian football, the people here are commenting on it. As for being an ‘Enigma’ if you don’t speak Portuguese and don’t live in Brazil than maybe you might see it that way… I personally don’t. The team structure may be poor compared to Europe’s, but you must remember that Brazil is still a developing nation. If you had ever been to Brazil and met its wonderful people and knew a little about their culture, perhaps you might understand a little more about their football and how it is organized. You are probably a terrible talent scout if you hold a bias towards Brazilian players. Maybe you could have signed Kaka or Pato for your club if you weren’t so ignorant. But I think that you are probably some fat, acne ridden teenager that failed his English classes and is jealous that his country’s football team gets their asses handed to them every time they play against the Seleção. any latest news for the upcoming Brazil CONMEBOL U-20 Championship team?? They start their campaign against Paraguay in Puerto Ordaz, Venezuela, on January 20th. Then play Bolivia (22), Chile (26) and Uruguay (28). Vasco’s Alan Kardec has replaced Palmeiras’ Marquinhos. thanks man!!! where can i find the full squad list?? any future star players?? I’m a recent discoverer of this blog (thanks to googling Hernanes) Any plans in writing a sequel in the near future regarding Brazil:the talent factory, very intresting reading. How is Willians doing in Palmeiras and what about Dentinho, only one year ago media where talking about a move to Real. yes, i’ll certainly be doing a new ‘talent factory’ in the future. Willians is doing well at Palmeiras – better than Marquinhos in fact (though the latter is still recovering from a hernia operation). Anybody, who knows about a TV-show in Brazil, where they had a group of talents battling each other with amazing skills. The judges in the show, were Dunga and Bebeto. I remember some names, Yuri and Celsino, what ever happened to them? Paul, are you planning to write anything about the Brazil U-17 team progress in Chile. Also, Neymar seem to be in the center of attention right now, but what do folks consider about Coutinho. Never seen this Zezinho kid before, but boy does he show similarities both in apperence and play like my alltime fave Rivelino…minus the moustache for the time being. I’m hearing that Milan is looking to acquire Hernanes and Miranda. Everyone knows Hernanes but I’m not too familiar with Miranda. Anyone have good intel on this kid? He’s supposed to be a good defender. Is he as good as Thiago Silva (Milan) or better? Does anyone know what has happened to Lulinha of corinthians I thought he was mentioned in the same breath as when alexandre Pato first broke onto the headlines with internacional. I think Sandro could be the next truly great volante for Brazil. He’s a beast. He and Giuliano will tear up the U20 World Cup. Could you give me your opinion on Tales and Renan Oliveira? Also is Oliveira part of the reason why Atletico Mineiro are doing so well at the moment? which Sandro? the guy at Inter? he’s not bad but he didn’t do too well on sunday though! same can be said of Giuliano. haha i haven’t seen much of Talles Cunha and he didn’t play vs Fla today. I know that they have a deal with traffic but not sure if gerimo are a team that has connections with traiffic. The next Roberto Carlos maybe he has speed and two good feet!